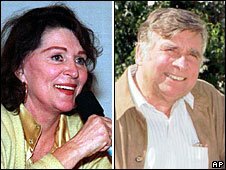 The ashes of Star Trek creator Gene Roddenberry and his actress wife Majel Barrett Roddenberry are to be launched into space. Some of Gene Roddenberry's remains were aboard the 1997 maiden flight of Celestis Inc, which specialises in space journeys. His wife, who was the only actor to take part in all five Star Trek TV series, died of leukaemia in December. The spacecraft carrying the couple's ashes is set to launch in 2012. 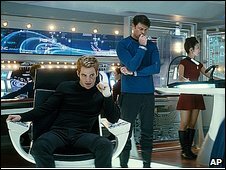 Gene Roddenberry came up with the concept for Star Trek in 1964 under the original title of Wagon Train to the Stars. It was not a great success initially and was cancelled due to low ratings after running for three series in a poor time slot. However, it found an audience in syndication and carried on for four more series and 10 films so far. The latest in the franchise, directed by Lost creator JJ Abrams, is due out in May. Majel Barrett, who married Roddenberry in 1969, was involved with Star Trek from the start. She was cast as second in command in a pilot which never aired and later played Nurse Chapel in the original series. As the voice of the computer in the follow-up shows and films she became an icon to fans and earned the nickname The First Lady of Star Trek. After her husband's death in 1991 she made sure that two of his unrealised projects Earth: Final Conflict and Andromeda made it to the small screen. It was Barrett Roddenberry who arranged for some of her husband's ashes to make the first memorial trip into space. The couple's son Eugene says she made it clear at the time that she wanted a joint mission after her own death. He said she hoped the rocket would "carry their spirits, memories, and the message of their life's work into the cosmos on an infinite journey into deep space". Celestis offers to launch cremated remains into Earth's orbit, onto the lunar surface or into deep space. The Roddenberrys are following James Doohan, who played Scotty on Star Trek, into space. His ashes were fired off in 2007 but the space flight lasted only four minutes before the rocket fell back to Earth. The rockets carrying the ashes usually burn up on re-entry into the Earth's atmosphere. A tribute site has been set up by Celestis so Star Trek fans can leave parting messages which will travel in the space ship along with the Roddenberrys. One couple from the UK wrote: "As we will look up at the sky and see the two brightest stars we will always think of you and the light you brought to our lives."